Who's that Knock-Knock-Knocking at the Gate-Way ? Mother Mary cooed at the Baby Jesus swaddled and clinging to her breast as they rocked to and fro upon the sweaty, cross-backed Donkey being led by her harried husband, Joseph. Strangers in a Strange Land in search of SomeOne like the Good Samaritan. Refugees in search of a Safe Haven. 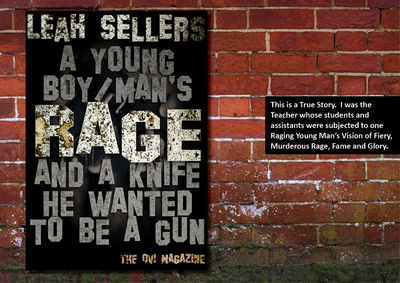 A Safe Haven free of Psychological and Physical Violence and Dark Power-Mongering UpRoar. Free of Bigotry and other forms of Psychological and Physical EnSlavement. Free of Chaos and hotbeds of roiling, boiling, coiling Human, Light Snuffing Darkness. Refugees seeking a Safe Haven to Re-Establish their Lives and Labors within. A Safe Haven in which to day-in-and-day-out strive for Individual and Mutual Dreams for a better and more Fruitful Future. Refugees seeking Open-Hearts and Open-Minds of Compassion and Understanding of what it is to Be a Refugee of any kind in any part of a Human Being’s Life or Location in Time and Space. Refugees seeking a New World filled with New Friendships and Passions, New Opportunities and evolving Dreams of endeavoring to be their Best and Higher, and more Delighted and Rejuvenated and Rejuvenating Selves. Concentrated Purging Camps bent on Separation of the Chosen Other. Concentrated Purging Camps Separating Babes’s like Jesus from the Loving Arms of Mother Mary’s and harried Joseph’s. Refugees seeking the Promised Land, and not an unnecessarily Abusive, Exclusive and Darkly Cruel, concocted Trauma-Drama-Land. Imagine a World devoid of the Jesus’ Rebellious Voice and Good News Message of Universal Love, Empathy and striving to Live All Together in Universal Harmony and Invigorating Peace. Imagine the Separating Purging of Mother Mary, Joseph and Baby Jesus. The Darkness of the Separating Purging of Selfish, Fear and Hate Based Nationalism-Tribalism is knock-knock-knocking and attempting to Knock Down the Golden Gates of Christ-like and Democratic Enlightened Thinking and Being once again folks. Who will Answer the Call at the Gate ? Valiant, Protective and Nurturing Guardians or Darkly Devouring Purgers ? 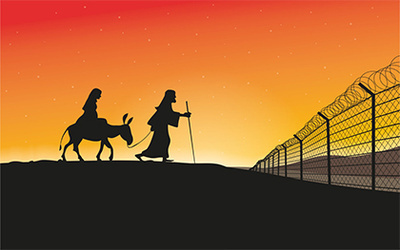 What would the traveling Refugees Mother Mary, Joseph and Baby Jesus Ask and Hope of Us All ?